Jason Concepcion: At the media availability session before Game 1, LeBron James scoffed at the characterization that his royal person could be something so base as an underdog. “Huh? Underdog? Me?” Bron sniffed. I get where he’s coming from. He’s the best player in the world, with the operating system of a point guard running in the chassis of a power forward. He’s a basketball Transformer. Nothing short of the radiating waves of his greatness — the mystical Tao of his leadership — have kept noted maniac J.R. Smith from morphing back into 3 a.m. Teen Wolf throughout the playoffs. And it was his parental influence in the first half of Game 1 that had the Cavaliers playing with “been there” sangfroid and running out to a double-digit lead. Meanwhile, the Warriors were playing like teens at their first dance, hearts almost audibly pounding, like sneakers bouncing around in a dryer. James cannot be guarded one-on-one by anyone in the world. James isn’t an underdog. The Cavaliers are. 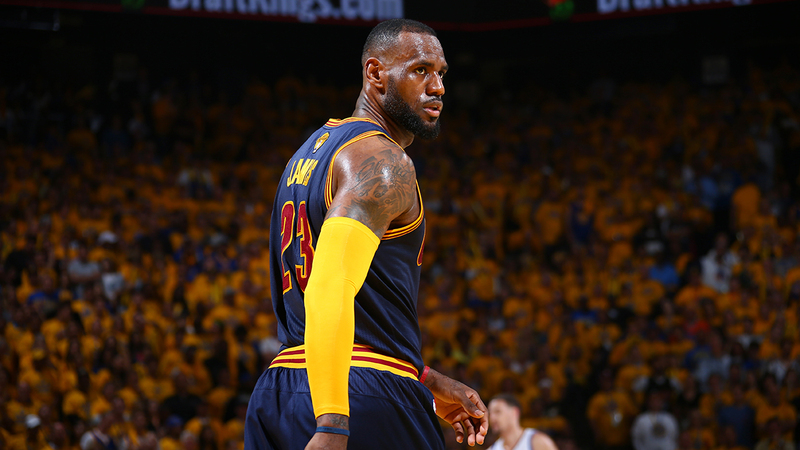 In Game 1, James scored 44 points on 18-of-38 shooting, with eight rebounds and six assists. Most of those 44 points came in the form of grinding isolation plays, that most maligned type of NBA offense. Per NBA.com, no player has operated out of the iso more often — 32.6 percent of the time — this postseason than LeBron. Again and again, James got the ball on the left side, his teammates cleared out, and he went to work bullying Harrison Barnes (or Klay or Iggy or Draymond) until he got deep into the paint, at which point he’d loft up a shot from practically inside the rim. If he missed, Tristan Thompson was there like his personal rebounding valet. As far as aesthetics go, it was about as subtle as brass knuckles. But the brutal simplicity of throwing the ball to the best player in the world and letting him hammer away hides the play’s advantages against the Warriors. 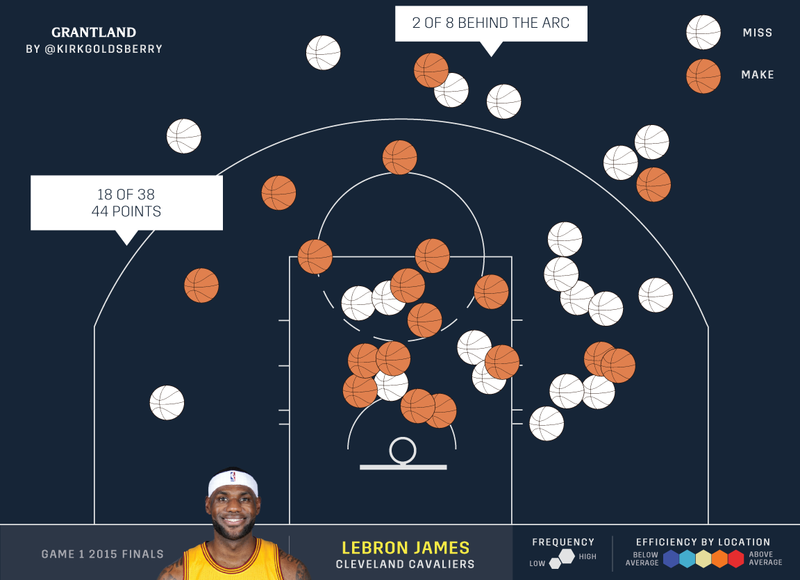 Sure, Bron is scoring only .68 points per possession in isolation in the playoffs. But against the W’s, going bare-knuckle iso means no pick-and-roll, which means no opportunity for Golden State to unfurl its scarily effective switch-everything defense. And it means the game bogs down into trench warfare, crucial for blunting the Warriors’ fast-break guillotine. And it was almost enough. Kirk Goldsberry: Stopping LeBron James is easier said than done. Obviously. But “turning him into a jump-shooter” remains the best way to turn him into a relatively average performer. Last night, the Warriors did that at the most important moment of the game. Per usual, James was dominant in the paint all night with floaters, rim attacks, and jumpers, but he was average outside of it — also per usual. He was 2-for-8 from beyond the arc and struggled to drain his favorite 2-point jumpers, along the left wing. But the biggest miss of the night was the 21-footer he took with three seconds left in regulation. That would’ve flipped the stories we’re all reading this morning. Andrew Sharp: Look at that clip. Look at how hopeless LeBron looks by the end. That’s what Golden State does to people. Even when the Warriors are losing, they’re a heartbeat away from running you off the court. They have too much talent to throw at teams. So let’s start with Klay Thompson coming up huge in the second half, nailing 3s, getting to the line when the Warriors needed offense, and guarding Kyrie Irving on the other end. He was great. Marreese Speights also came off the bench to hit big shots when Cleveland was threatening to take control. Harrison Barnes came up huge. And there was Steph Curry, who took over toward the end of the fourth quarter and into overtime. But if there’s anyone who deserves to be singled out, it’s Andre Iguodala. He guarded LeBron and took a beating in the post, he buried big 3s, he leaked out for breakaway dunks. In the end, he played 32 minutes off the bench and scored 15 points, all while dealing with the most dominant player on earth. Iguodala is making $12 million this year, and Golden State can afford a $12 million former All-Star as a backup in part because of Barnes’s rookie contract, and in part because of Curry’s cheap extension. It allows them to get the most out of Barnes by using him with the starters, while they deploy Iggy as a specialist, resting his legs to save him for games like last night. It’s unfair how perfect this arrangement is. Chris Ryan: Not to invoke a sportscaster trope that will drive our buddy Bryan Curtis up a wall, but Kyrie Irving has a knee. That’s a problem for the Cavs. The problem for Kyrie, and for those of us who count ourselves as fans of his game, is that Kyrie doesn’t just have a knee. He’s got it all, and he’s had it for a while. In college he had a toe; in the pros he’s had a finger, a hand, a nose, a shoulder, a knee, and a bicep. In the playoffs he’s had a foot and a knee. On Thursday, he played 44 minutes, the most time he’s spent on a court in almost a month. Should he have been out there that much in his first game back? He scored 23, dished six, and grabbed seven, but he went down in overtime. He stayed in the game for the next sequence, almost immobile, standing out beyond the arc while Harrison Barnes hit a key 3. After David Blatt called a timeout, Irving limped off the court with a trainer. When he was through the tunnel, he tore off his jersey and visibly grimaced, struggling to make his way to the locker room. After the game, when pressed about whether he would be getting an MRI, Irving absentmindedly touched his face and smirked, but his eyes were wounded. He talked about taking necessary steps — like getting his MRI — but there was something in his eyes that went beyond worry. Irving needed crutches to leave the visitors’ locker room. He said he felt something “different” in his knee. For someone with his injury history, that feeling was probably all too familiar. Rihanna now chatting with Joe Lacob. 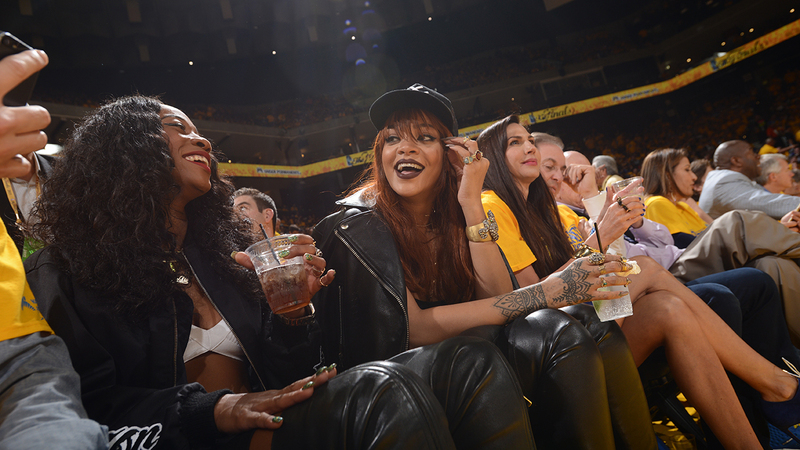 Joe Lacob's fiancee now sitting between Rihanna and Joe. For some odd reason, Rihanna screamed "LeBron.." several times by Cavs locker room. Danny Chau: Late in the second quarter, Andrew Bogut did something I’d never seen before. Diving hard to the rim on a transition play, he caught a lob from Steph Curry and became the first player in NBA history1 to flip an uncontested alley-oop dunk into a pass for an uncontested corner 3. It flew in the face of logic and was egregious enough to give traditionalists heart palpitations. Teams just don’t do things like that, especially not the championship front-runners. But the Warriors are wired differently, and it’s part of the reason why it’s been such a blast watching them cruise on by in the playoffs. Over the course of the regular season and the playoffs prior to last night, Bogut went 40-for-53 on his alley-oop finishes. That’s 75.5 percent. Over the same stretch of time, Warriors players shot 157-for-326 from the right corner 3, where Klay Thompson was the recipient of Bogut’s pass. That’s 48.5 percent. Obviously, Bogut going for that alley-oop finish himself was a higher-percentage play, but it ignores the fact that his pass was a measured gamble — a 3-pointer is 50 percent more valuable than a dunk. A Bogut alley-oop attempt has an effective field goal percentage of 75.5. A right corner 3 from a Warriors player has an eFG% of 72.2. If you counted only regular-season attempts, a 3-point attempt from the right corner would actually be more likely to yield points than a Bogut alley-oop. While the Cavs have gone through numerous identity changes throughout the season, the Warriors have remained the same juggernaut — and they’ve done it their way. In nearly any context, what Bogut did was unbelievably dumb, but when you can shoot as well as Golden State can, you get to form your own logic. Thompson missed the wide-open 3 he attempted after the pass. When Bogut got the rebound, he could’ve easily gone right back up and scored over Iman Shumpert, a player 7 inches shorter than him. He didn’t. He slung the ball right back to Thompson for another 3. Klay nailed it this time. I obviously can’t confirm this but, I mean, come on.